Cleansing is the word traditionally used, but you can think of it as a shift in energy from any negativity to a more positive, peaceful state. Smudging can be used to cleanse an object, a place, or your spirit, mind or body. The herbs are burned in a small bowl or a shell, such as an abalone shell. The shell represents Water, a gift from the ocean. The smoke is distributed with a feather, a gift from our winged friends. 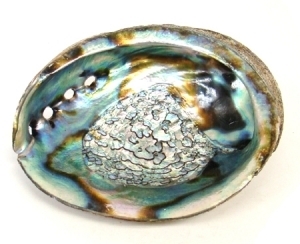 When looking for a vessel to burn your sage in look for natural materials such as shells (abalone shells are traditional). Do not use man made or synthetic materials such as glass, aluminum or metal. The vessel should also be heat resistant and fire proof. Using a natural material vessel keeps the process respectful and sacred.